I had the day off today, so I thought I’d give curious readers a semi-objective taste of a work-free day in Cairo. Fortunately, WordPress reverted me to the saved draft, which was just a blank document. However, the title of the post was saved. Whew. 10:00AM – Grade 11th grade essays over burnt cappuccino and a tasty California omelet. 12:05PM – Mission: purchase a shower curtain and light bulbs. Endeavor to locate a remote for broken heating unit. 12:10PM – Successfully – and rather expensively – purchase 6 soft white light bulbs. Feel encouraged by this experience. Ask if store sells “takif remote.” Takif is air conditioning, but you do not know the word for heater. Mime using a remote. The man tells you, “Maraba” and points left. As you do not know whether this is a store name or a word in Arabic, you depart and walk left. You resolve to enter any and all stores appearing to stock electronics. 12:15PM – Two more stores direct you left. Continue. Avoid young boy chasing his friends with taut neon bow and very pointy object. Imagine arriving in a hospital with an arrow in your buttocks. Walk more briskly. 12:20PM – Enter Happy Family,the home goods store. Find shower curtains with assistance of friendly veiled woman. Ask for rod. When this does not work, “draw” a rod in the air using your fists. Nod when cashier says there are no rods here, but points left. Choose the cheapest shower curtain and depart. 12:25PM – Search optimistically for store appearing to sell rods and remotes. Reach the end of the road. Choose between two options: A) Walk back down the road and drag an employee out to help you or B) Go home. Give him a ten instead of five because he has cheered you up. Attempt to start laptop in order to record experiences. Find the battery dead. Plug laptop in to socket #1. Watch plug slip out of socket. Plug laptop in to socket #2. Station yourself on the floor. Read laptop message, telling you that it hasn’t been shut down properly and must now execute a lengthy and very complicated disc check where it will resolve that all is well before turning on and probably shutting down spontaneously later on. 1:00PM – Drag chair into bedroom to insert new bulbs into light fixture, with the domestic excitement of someone who has purchased a not-entirely-necessary product. Find that light bulb is too big for socket. Entertain double entendres. Hear Benjamin Franklin’s voice in your ear: Measure twice, cut once. Decide you cannot be angry, since you did not measure at all. 1:05PM – Be lazy. Ask boab to locate light bulbs and procure remote. Find that boab is not as impressed with your Arabic as cab driver. Wait while boab pages resident Anglophone to translate. Thank him for agreeing to call the mechanic. Ask for light bulb back. When this does not work, ask for light bulb that emits yellow light rather than white. Thank Gretel for teaching you the Arabic word for yellow. Say, “Asfar” and point at light bulb. When this fails, point at the yellow stripe on his shirt. Pluck the yellow leaf off the potted plant. Watch as he pages woman again. Listen to the word “asfar” bandied about, exactly the way you were saying it. 1:15PM – Enter the bank with your light bulb. Withdraw LE for Gretel. Show e-ticket on iPhone to obtain USD. Leave bank with LE and mounting frustration. Return to light bulb store and purchase 6 new light bulbs. 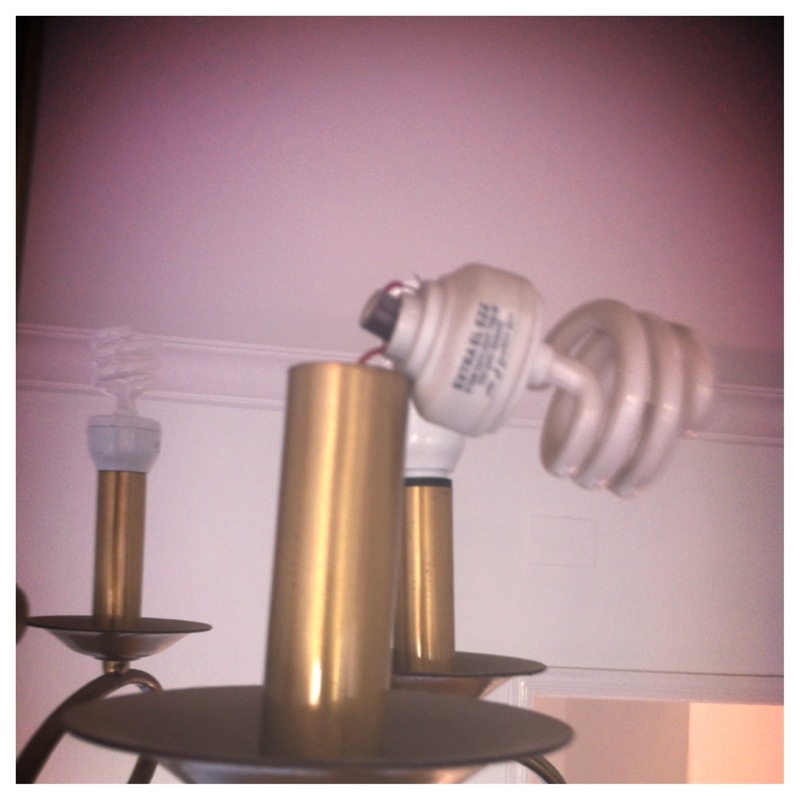 1:50PM – Remove old light bulbs from light fixture. Screw in new ones. Feel giddy about impending light. Flick the switch on the wall and cry, “Eureka!” Watch as one single bulb of the six triumphantly illuminates. Dismay: The chandelier has faulty wiring. Joy: You now have five spare light bulbs should the single bulb find the burden of shining too much to bear and blow out before its advertised 8-year life expectancy. 2:00PM – Turn on zippy new laptop you have been enjoying for over a week and find that it has suddenly locked itself and requires a password. Try four passwords. All are incorrect. 2:01PM – Grab your guitar and open a beer. 2:02PM – Too early for a beer. Opt for one of Myles and Matthias’ German chocolates with whiskey in the middle instead and enjoy the rest of the afternoon. Cairo hasn’t yet taught me patience, but it has showed me how to find the silver lining in just about anything. In retrospect, this should have been an indication that something was awry. Hey, thanks for the compliment! What a neat idea. I will definitely check out your post about the award…and your other posts : ) Cheers!